I was back at the Baltimore Museum of Industry again last weekend. This time I was observing my wife's school's entries in the elementary theme park challenge. 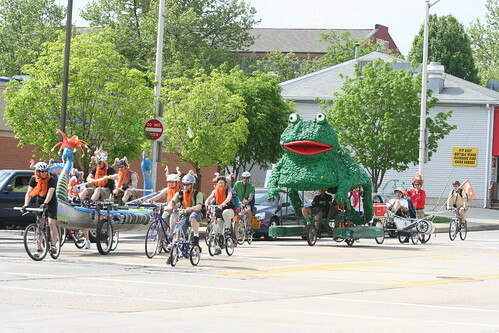 By an odd scheduling quirk, it was the same day as the American Visionary Art Museum's Kinetic Sculpture Race. The kids finished their presentation and had a few hours to kill before the awards were presented. Fortunately, that was about the time the sculptures started rolling down the road. 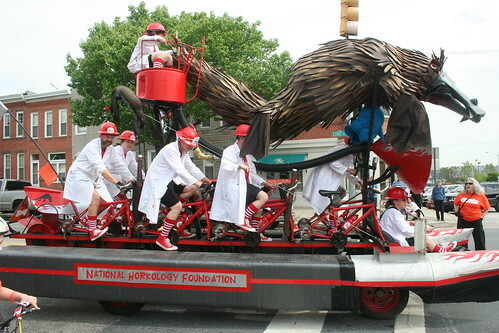 These racers have to be human powered and they were so in a number of very inventive ways. The Platypus Racer was one of the first ones to come by. They really had the spirit of the event with matching costumes. The entourages that rode along with the racers sometimes enormous. For the next hour a steady parade of racers turned onto Key Highway as the early leg of the race. 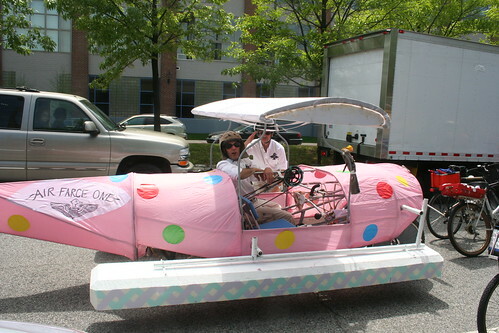 One of the best racers as far as craftsmanship was Air Farce One. When the BMI event was over, we moved over to Boston Street near Canton and managed to get an incredible parking spot. I got there in time to catch some of the last racers doing the water portion of the race. This section was perhaps the most challenging. The racer has to go down a boat ramp, float around the dock, and get back up the ramp. Getting up the ramp was the trickiest part. The ramp was steep and say too many racers didn't have the power or traction to get all the way up. Most required a push and the accompanying time penalty to get onto dry land. 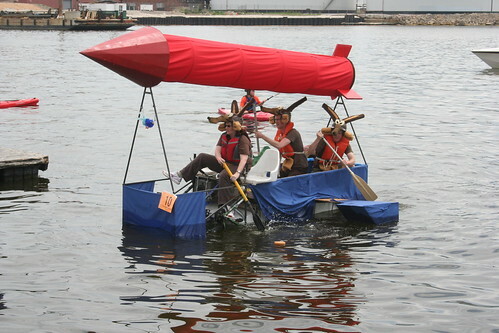 While the bike/boats were getting wet, the other racers were waiting for the next leg. This was a great chance for me to go down the road and get pictures of all the entrants. 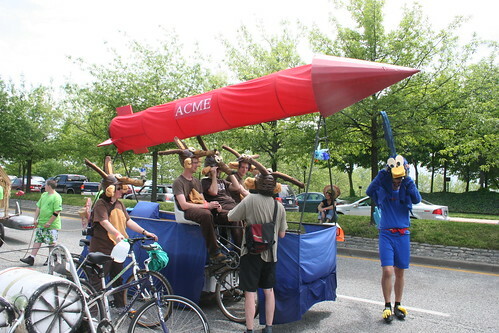 My favorite was the Wiley Coyote themed racer with all the kinectanauts dressed as the ill-fated predator and one of the crew members all road-runnered up. I put a bunch more pictures into a Flickr group, so check them out. BlatantCommentWhoring™: What is your favorite whacky event? "What is your favorite whacky event?" My life! No good answer to the posted question - 2fs took what could have been my best response. Thanks for the pics. We missed the send off and went to Patterson Park for the obstacle course. By the time the racers get there, several of them look different than when they started. We have a couple around here that are pretty cool. One is the milk carton boat race in Minneapolis. For that you have to construct you entire vessel out of milk cartons and sail them across a small lake. 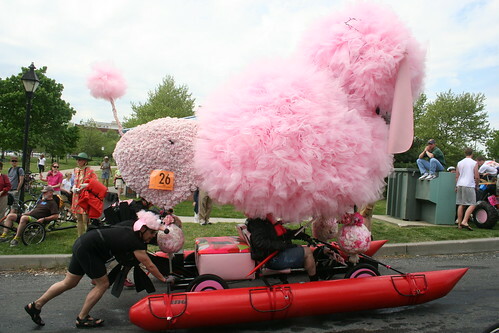 The other is the bed races down a local ski hill. That's a pretty common one but still always good for a laugh.